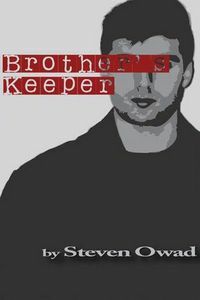 Brother's Keeper by Steven Owad, a Mysterious Review. Review: Steven Owad has crafted a suspenseful tale of secrets and betrayal with a bit of a hard-boiled edge in Brother's Keeper. The story opens in Poland with journalist Vince Maguire, an ex-patriate New Yorker living in Warsaw, getting a call from his brother Teddy, someone he hasn't seen or spoken to in years. Teddy will be arriving in Poland on the following day. Both excited and wary, Vince goes to the airport but instead of seeing his brother, is met by Marty Forlani, a friend of Teddy's. Marty says Teddy's been delayed and Vince reluctantly agrees to put Marty up for the night. But later that evening, Marty virtually kidnaps Vince, forcing him to participate in a botched murder attempt that leaves Marty dead instead. Fearing he'll be implicated in the crime, Vince flees Poland for Alberta, Canada, where Marty was living and where Vince believes he'll find his brother and, hopefully, answers to why he was dragged into a ruthless murder. Brother's Keeper is a fast-paced thriller, written (at least initially) with short, clipped sentences and sentence fragments giving the plot a sense of urgency. The author fills the narrative with descriptive details and noir-ish similes painting Warsaw as cold, bleak, and gray … not unlike Vince's life in his adopted home. The confusion that Vince feels, being part of an attempted murder gone terribly wrong, is credible yet his journalistic instincts tell him there's more, far more to this story. When Vince gets to Alberta, the descriptions of its snow-covered vastness seem to convey an image of a blank page, where the next chapter in Vince's life will be penned. This is a very well constructed, plotted, and written novel, though there are a few points that don't quite ring true. Vince has very little cash when he leaves Poland and cannot use a credit card for fear of being tracked, yet is able to purchase airfare from Germany to Alberta, rent hotel rooms and cars, and pay for other travel expenses without difficulty. The action, or in some cases inaction, of a few of the characters seem "out-of-character" and arbitrary. And, in an ironic way, as Vince gets stronger in his convictions and manner, the writing gets weaker and loses some of its edge. But these, together with a few loose plot threads in the end, are all minor quibbles that don't detract from this exceptionally compelling novel. Acknowledgment: Steven Owad provided a copy of Brother's Keeper for this review.